Maybe its just a Mustang thing, but once you’ve committed yourself to owning one, you seem to notice there’s a lot of others out there driving the same car. In fact, noticing someone else driving a Mustang with a similar color to yours is almost unavoidable. But that doesn’t mean your particular paint scheme is popular. Sure, the usual suspects like red, black, silver and so forth are popular, but have you ever wondered how many people actually prefer those colors? 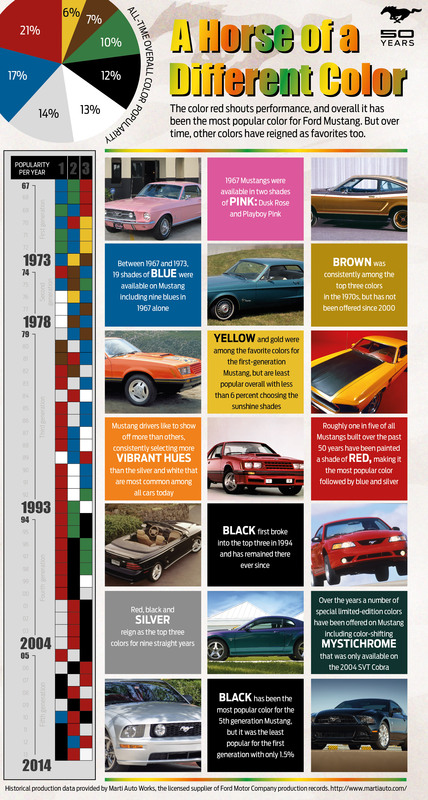 Ford has the answers–they’ve broken down every year of Mustang production by the three most popular colors and showed us what has sold the best throughout the last 50 years. Red is the most popular (no surprises here) and can be found on around 1 in 5 Ford Mustangs, but throughout the 70’s you might be surprised to find that Brown was a consistent top-3 contender for the most popular Mustang color. Black has since taken over our garages by commanding a large portion of SN95 and S197 cars, but who knows if that trend will continue when the 2015 Mustang debuts. It seems with most shifts in design and decade there comes a shift in color preference, as well. Whats also interesting is how Ford’s numbers match up to AmericanMuscle’s survey of customer’s favorite Mustang colors. Competition Orange, a specialty color, dominated the hearts of Mustang enthusiasts, but aside from that, the preferred colors were in line with what Ford reports as most popular of all-time. It will be interesting to see how the Mustang communities preferences shift with the new design as it seems some colors just look better on different generations of Mustangs.